Melody attended Ferris State College, Florida Southern, and South Florida earning her dental credentials. She has over 30 years experience working in dentistry and has been with Dr. Nerestant for almost 20 years. She likes helping patients learn about oral health, what it takes to have healthy gums, and the best ways to care for their teeth at home. 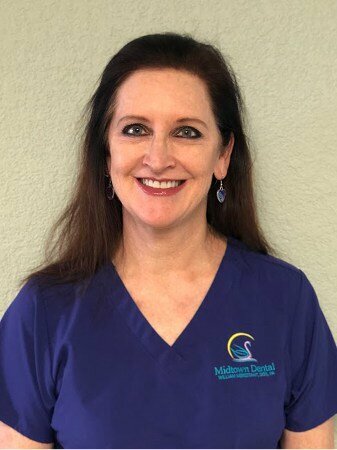 Melody loves getting to know her family of dental clients, the fun and friendly office atmosphere, and making people healthy. If she wasn’t working in dentistry, Melody says she’d probably be an executive at Southern Wine & Spirits. She also says that the five words that describe her best are wine, wine, wine, wine, and wine. Outside of the office, Melody volunteers with the SPCA, American Cancer Society, and First United Methodist Church. She enjoys working out, walking, hosting wine events, hanging out with friends, traveling, and making jewelry.